"It has often been said that Australia has an old land surface, the implication of this being that the soils and underlying materials have been so strongly weathered that they are now infertile. This idea has to be qualified. While many areas of Australia have been exposed to weathering for many millions of years, many of its soils and surfaces, particularly those in the eastern part, are quite young, in fact as young as many in other continents, including those which were widely affected by glaciation. Even in those parts of Australia where there has been severe and deep weathering, older surfaces have been dissected and progressively younger soils have been developing in the older weathered materials. Simultaneously new surfaces have been developing on the sediments eroded from the old land surfaces and these sediments have in turn been reworked by the action of wind and water". (Beckmann 1983a, 51). Celery cropping on Brown Chromosols near Cranbourne. Photograph: Mark Imhof. Soils have formed (e.g. Paton 1983, Paton et al. 1995) upon a wide variety of parent materials under a range of past and present climatic conditions in different regions of Australia (e.g. Beckmann 1983a). Aeolian (e.g. Butler and Churchward 1983), eustatic (e.g. Ward and McArthur 1983) and fluvial (e.g. Walker and Butler 1983) processes together with those associated with calcrete formation (e.g. Milnes and Hutton 1983), salinity and sodicity (e.g. Northcote and Skene 1972, Isbell et al. 1983) and the stripping of deep weathered mantles (e.g. Churchward and Gunn 1983) are some of the factors which have affected the formation of soils in many States, including Victoria. The development of soil landscapes in Australia was discussed by Beckmann (1983b) and Hubble et al. (1983), with broad references to some of those in Victoria having been made by Walker et al. (1983) and Walker (1986). 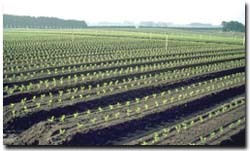 Soils are classified using different systems such as the Soil Taxonomy scheme in the USA (e.g. Soil Survey Staff, 1992; Ahrens and Arnold, 2000), the soil orders of which were introduced by Wilding (2000) prior to detailed review by other authors (Sumner, 2000: E-183 - E-392). Systems for other countries were summarised by Spaargaren (2000). A review of soil mapping in Australia was presented by Gibbons (1983). The Great Soil Groups presented in `A Manual of Australian Soils' (Stephens, 1962) led to `A Handbook of Australian Soils' (Stace et al., 1968). The first edition of the `Factual Key' of Northcote (1979) was published in 1960 and, as Gibbons (1983) noted, this scheme was prepared for the `Atlas of Australian Soils' (Northcote et al., 1960-68). 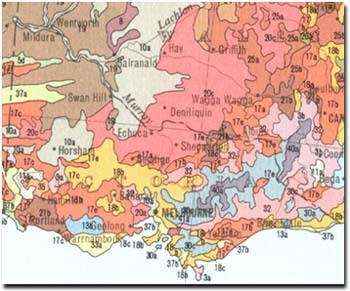 Isbell's `The Australian Soil Classification' was published in 1996, and the mapping of Victorian soils using this scheme is currently being undertaken (M. Imhof, pers. comm.). In order to facilitate continuity between older data sets and reports, the systems of Stace et al. (1968), Northcote (1979) and Isbell (1996) were all used in the preparation of the present series of articles. Approximate correlations between various soil classification schemes were presented by Stace et al. (1968), Northcote et al. (1975), Butler and Hubble (1977), Moore et al. (1983) and Isbell (1996). Various characteristics of Australian soils were presented by Russell and Greacen (1977), Oades et al. (1981), Hubble et al. (1983), Chittleborough (1992), Chartres (1993), Isbell (1995) and Charman and Murphy (2000). The formation and characteristics of soils in Victoria were discussed by Hills (1975), Jenkin and Rowan (1987) and Leeper and Uren (1993). Dryland and irrigated agriculture operate predominantly under the interaction between climate and soils in different regions. Particular problems such as soil salinity, soil sodicity and various forms of land degradation are discussed as separate articles which include the characteristics of affected soils and management strategies. Specific examples of environmental and agricultural issues are presented at the [regional level]. The NSW Department of Primary Industries has a number of soil management guides (external link) available for download from their website - including the SOILpak series of management guides that provide soil type and industry specific information on aspects of soil such as structure, fertilizers, cation exchange capacity, earthworms, composting, interpreting soil tests, compaction, organic matter and acidity.